Austrian design team harnesses plastic-eating mushrooms to help hunger. Count the things made out of plastic that you can see even just sitting at your desk – water bottles, pen caps, iPhone cases, coffee lids, shopping bags, tape dispensers, everything else – multiply that by a trillion or so, and you have an idea of the scope of the plastic waste on earth. Now, just for fun, try to imagine the roughly 870 million people around the globe who are starving right at this moment. It’s enough to make you want to disown this garbage world we created. But the good news is that for every problem, there are thousands of smart people trying to solve it. And Austrian designer Katharina Unger has figured out how to harness the power of a rare fungus that can turn plastic into edible biomass. It all started back in 2012, when Yale researchers found a rare mushroom in the Amazon (Pestalotiopsis microspora) that was capable of breaking down polyurethane, the main ingredient in modern plastics. That led to a lot of scientists trying to figure out how to use the fungi to deal with the world’s very real plastic waste problem. Unger, who was previously known for creating a kitchen appliance that incubated fly eggs into larva for the purposes of human consumption, took the idea one step further and resolved to figure out how to use fungi to recycle waste into food. Together with Julia Kaisinger and Utrecht University, she created the Fungi Mutarium, which turns mushrooms into an edible product. 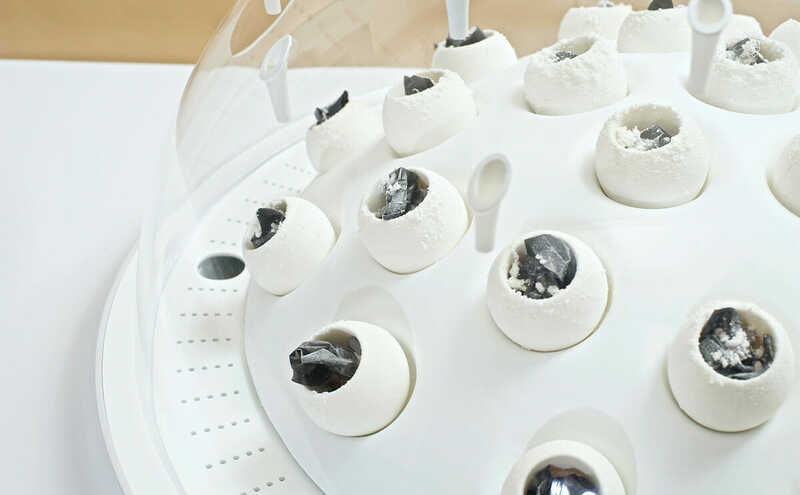 The Fungi Mutarium is comprised of egg-shaped pods made with agar, a seaweed-based gelatin substitute, that serve as a base for fungi cultivation. The designers call these cups “FUs.” After loading them with plastic waste, fungi are introduced, and the mushrooms feed on the FUs’ starch and sugar along with the plastic. After a few months the plastic is gone, and in its place is a puffy edible substance. The end result looks a bit like an egg-shaped rice cake, which could be used as an edible cup to hold any number of foods (the designers provide some suggestions, like seaweed and caviar, or fruit and yogurt). Though the idea is still in the incubation stage – you’re not going to be able to buy the pods at the supermarket any time soon – it’s a promising solution to a problem that most of us unconsciously contribute to every day. And just one more way that mushrooms could eventually help us clean up this mess we’ve made of things. Could the mushrooms soon be available for purchase? I’m very introsted in learning about fungi that eats plastick and the wast is food . Fungi digest the debris of a rain forest which without this intercession would be piled deeper than the height of the trees. Nature may be the answer for dealing with plastics as well. Phasing out plastics with other natural materials will also help.